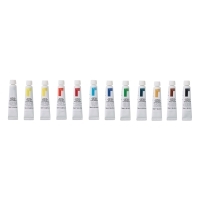 Acrylic School Pack of 144 Colors — Set of 144 tubes, 10 ml each, includes 12 tubes each of Titanium White, Lemon Yellow, Medium Yellow, Brilliant Red, Crimson, Blue Lake, Phthalo Blue, Light Green, Phthalo Green, Yellow Ochre, Burnt Sienna, and Mars Black. 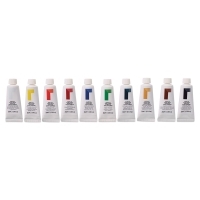 Paint Pot Set of 12 Colors — Perfect for smaller projects. 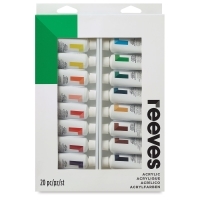 Twelve rich liquid acrylic colors are set in 12 ml plastic pots that are linked together for easy portability. 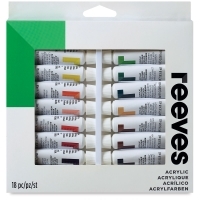 Colors include: Yellow, Brown, Crimson, Orange, Red, Magenta, Green, Blue, Blue Violet, Violet, Black and White. 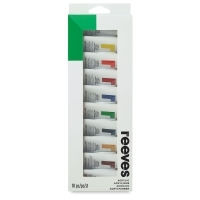 Set of 10 Colors — This set contains 10 colors in 22 ml tubes, including Titanium White, Medium Yellow, Brilliant Red, Crimson, Phthalo Blue, Light Green, Phthalo Green, Yellow Ochre, Burnt Sienna, and Mars Black. 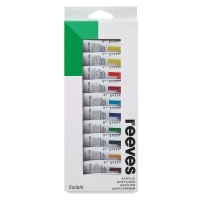 Set of 12 Colors — This set contains 12 colors in 10 ml (.3 oz) tubes including Titanium White, Mars Black, Lemon Yellow, Medium Yellow, Brilliant Red, Crimson, Blue Lake, Phthalo Blue, Phthalo Green, Light Green, Yellow Ochre, and Burnt Sienna. 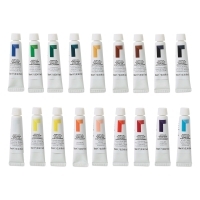 Set of 18 Colors — This set contains 18 colors in 10 ml tubes, including Titanium White, Phthalo Blue, Lemon Yellow, Light Green, Medium Yellow, Viridian Hue, Orange, Phthalo Green, Flesh Tint, Yellow Ochre, Brilliant Red, Burnt Umber, Crimson, Burnt Sienna, Violet, Payne's Gray, Blue Lake, and Mars Black. 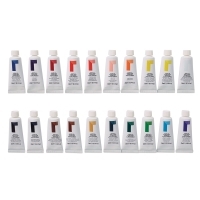 Set of 20 Colors — This set contains 20 colors in 22 ml tubes, including Titanium White, Medium Yellow, Brilliant Red, Crimson, Phthalo Blue, Light Green, Phthalo Green, Yellow Ochre, Burnt Sienna, Mars Black, Lemon Yellow, Orange, Flesh Tint, Vermillion, Violet, Blue Lake, Ultramarine, Viridian Hue, Burnt Umber, and Payne's Gray. 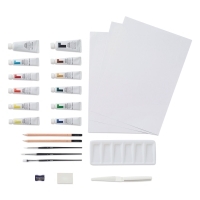 Complete Painting Set — This set contains all the materials necessary to create paintings from start to finish. 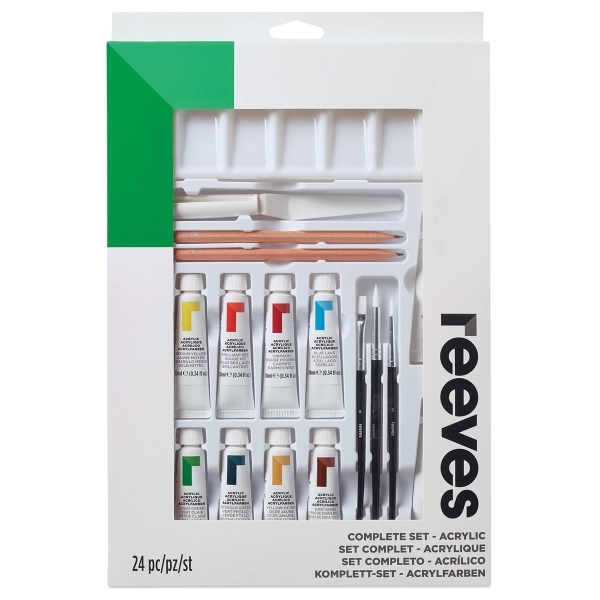 Contents include 10, 10 ml tubes of Reeves Acrylic (Lemon Yellow, Medium Yellow, Brilliant Red, Crimson, Blue Lake, Phthalo Blue, Light Green, Phthalo Green, Yellow Ochre, and Burnt Sienna), 22 ml tubes of Titanium White and Mars Black, three brushes, sketch pencils in two hardnesses (HB and B), plus a palette, eraser, sharpener, mixing knife, and instruction manual. 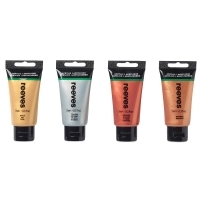 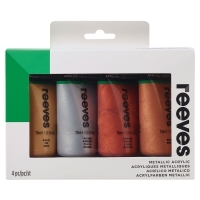 Metallic Set of 4 — This set contains four metallic colors in 75 ml (2.5 oz) tubes, including Gold, Silver, Copper, and Bronze. 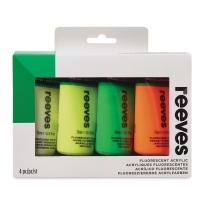 Fluorescent Set 1 — This set includes Fluorescent Orange, Fluorescent Yellow, Fluorescent Green, and White in 75 ml (2.5 oz) tubes.